When I was attending Cornish up in Seattle I lived in a group house with other performers, ( that was a blast!) One of my house mates knew how to play Diamonds and Rust on the guitar, and one day she sat down and taught it to me. Since I am not a highly trained guitarist, the opening lick is probably the fanciest thing I can play! 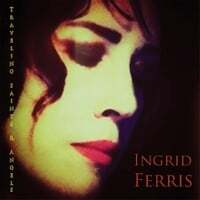 "Ingrid's voice penetrates my inner being. Progressive, organic, soulful, transcendental, never heard before, new ground music, folktronic!" Please Like my page, thank you! Sign up for upcoming concert info.! Ingrid Ferris presents her debut video, the Joan Baez penned Diamonds And Rust. Produced by Left Coast Digital, Olympia, Washington. Filmed at Arcade Studios, Tumwater, Washington. © 2019 Ingrid Ferris. All Rights Reserved. Powered by HostBaby.